Collectors of Rock'n'Roll paraphernalia will be ecstatic to own this Rock-Ola Neon Clock. The Rock-Ola company was known for manufacturing the finest jukeboxes across the land. Image Time has a history of providing its customers with prime time keeping devices rendered in detail faithful to historical design. This Rock-Ola clock is as unique as the company which brought the world jukeboxes and pinball machines...and it's just as reliable. Image Time clocks are well known for rendering decades of accurate time tracking service to owners everywhere. Recipients of this rocking clock can adorn their walls of work or home joyfully with a reminder of the jukebox era known for rock'n'roll! 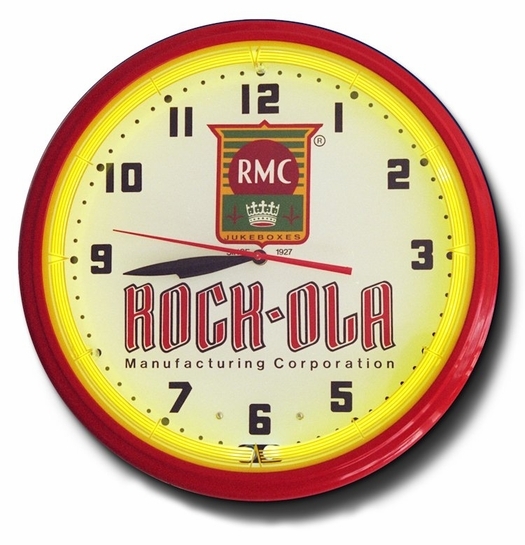 The Rock-Ola Neon Clock by Image Time makes an awesome gift idea! Subject: Neon Clock for Rock-Ola Manufacturing Jukebox fans. Ask a question about Rock-Ola Juke Boxes Neon Clock, High Quality, 20 Inch. Excellent price, quick ship and really love the retro look of this clock. A handsome addition to my Rock-Ola jukebox. Everyone thinks the clock is truly vintage.